Welcome to the most enjoyable, easy-access hip-hop album you're likely to come across this year. With the release of LiveLoveA$AP, the positive influence of the internet on the next generation of hip-hop has finally taken form in a way much more accessible than with Lil' B. So, allow me a bit of token regional exploration before we get to the actual meat of what makes this mixtape so enjoyable. ASAP Rocky is, already famously, a descendant of Harlem and all that entails (Dipset!). His main producer to this point, Clams Casino, hails from the college life of northern New Jersey. Clams' major claims to fame have come via production work for the aforementioned Lil' B and fellow Californians Main Attrakionz. And yet this album opens with a track, "Palace", whose most captivating moment finds Rocky rapping like a forgotten member of Three 6 Mafia's horrorcore era (I vote Koopsta Knicca), and quickly makes inroads on a soundscape that sounds way more Swishahouse circa-1995 than New York, or Jersey, or California circa-anytime. Well, besides the ethereal "Wassup" that brings to mind previous Clams Casino masterstrokes like Lil' B's "I'm God". The point is, if you care at all about drawing lines in the sand with your hip-hop, LiveLoveA$AP offers a lot of contradiction to your hypothesis. Because in a world where certified technician-style MCs like Jadakiss and Fabolous have spent the past four-ish years trying to bring New York to the sounds of Atlanta, ASAP, Clams and the rest of the people involved with this realized bringing anything anywhere doesn't matter. What's important is that your music feels natural and your persona free of shoehorning. What's absolutely crucial is that you aren't chasing anything, particularly as a rap artist. Granted, it's easier to fake your way to authenticity in hip-hop these days - just ask Rick Ross. But then ask yourselves whether you'd find Ross so easy to deny if the truth didn't deny him for you, or if he's actually quite believable as a decadent Freeway-Ross-that-wasn't-caught behind the veil of Oz. If you come to the conclusion that fantasy is oftentimes more desirable in music than reality, you're ready to focus on what makes ASAP Rocky such a great addition to the scene: his music is awesome. "Purple Swag" was inescapable in its previous form as a two-minute YouTube video, but with added features from fellow Three 6 fanatics SpaceghostPurrp (from Florida of all places, if you're still trying to connect dots) and ASAP Nast, it becomes even more of an anthem for lazy summer Sundays than previously. Elsewhere, "Houston Old Head" is a slow rolling ode to the more earthy knowledge bases of past-generation Southern black males. "Leaf" flirts with the upper echelon of 2011's odes to dope smokin', while "Get Lit" and "Roll One Up" act as perfect smoking buddies and, well, "Bass" lives up to its given name. For some, a lack of so-called substance could work against LiveLoveA$AP. Rocky's definitely a young kid talking about the things that please him and little else, which could effectively turn away listeners that hope their hip-hop can take a little timeout from enjoying life every so often to complain about some stuff. But it's this writer's opinion that "realness" doesn't deserve to be confined to ghetto street corners and hyperreal town hall meetings. Sometimes, it can be as simple as sitting in a freshly waxed car, windows dropped, speakers on blast, the world, by all accounts, your oyster. That's how Rocky and his fellow ASAPs (Always Strive and Prosperers) sees it on "Trilla", and how LiveLoveA$AP allows us to look at the world. Sometimes that's all anyone should want to ask for. LiveLoveA$AP is the sort of album that clocks in at nearly an hour but feels like it's over in half that. It's hard to believe the airy, saxophone-drenched "Keep It G" is our halfway point, or that the slightly darker, inward-looking tones of "Demons" and "Out of This World" are really where we have to part ways. Luckily, that's what repeat settings were designed for, something I've been abusing a bit lately. There are more impressive rapping performances in 2011, from Kendrick Lamar to Jay-Z to Big K.R.I.T. And there are probably a few more notable production jobs as well. 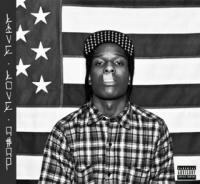 Quite frankly, it's hard to argue that LiveLoveA$AP does any one thing better than its closest peers. But by its powers combined, Rocky's debut free album/mixtape/whatever turns in the equivalent of a top-of-his-game Scottie Pippen performance. It looks effortless, and possibly insignificant in comparison to the much more obvious greatness of his closest peer... until you check the stat sheet and realize it adds up to something pretty amazing in its own right.